Earlier, 614 S. Church St.
Como Photo is the oldest film processing lab still in operation in the state of Wisconsin. Begun in 1918 by Lloyd Cook and Harris Montgomery, CO-MO PHOTO, as it was known back then, started as a firm that photographed city scenes, then developed and sold them all over the state as post cards. Originally the company was located in Lake Mills, Wisconsin. Later, the lab took in film for processing from the general public, and began servicing area drug stores. It was at this time the move was made to Watertown. By the mid-twenties, the lab was out of the post card business, and concentrated on film developing only. Cook had expanded to a larger lab in Milwaukee, while Montgomery, and Bernard Schaufler who joined CO-MO in 1920, continued to run the business. In 1933, Cook and Montgomery sold the business to Schaufler, who continued to run it until 1946 when he sold out to Bill Welch, an employee of the Milwaukee plant since his return from World War II where he served in the Air Force in Europe. 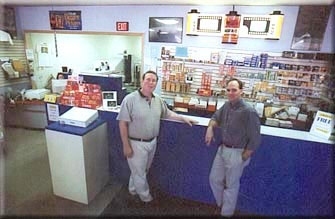 Bill, along with his son Jim, who joined the business in 1976, ran Como Photo until 2003 when long-time employee Paul Strohbusch acquired the company. Como's rich history has given it a foundation based on quality images, products and services. But that history hasn't kept Como Photo in the past. Como's continued success in customer satisfaction is due, in part, to a history of keeping up with the technology and improvements that the photo imaging industry has developed over the decades. Now the baton has been passed to the current owners who recognize Como's history, and stand ready to continue a photographic tradition that values the past, while providing up to date service. It seems like the occurrence of developments in photo imaging technology has accelerated. Como Photo is committed to looking to the future with upgrades that will allow you to take advantage those new developments, while continuing superior service in more traditional products and processes. A big part of quality imaging are the 'tools' themselves. We carry the best still cameras (both film and digital), video cameras, and lenses. We carry a variety of film, memory cards, tripods, filters and other accessories to help you take more great photos and have fun taking them. We also carry frames, photo albums, and many other products to help you display your photos in the best way possible. At Como Photo we have a selection of quality used camera equipment, as well. In addition to our great products, Como Photo has an expert staff with the knowledge to answer all of your questions and help you pick the equipment that fits your needs perfectly. 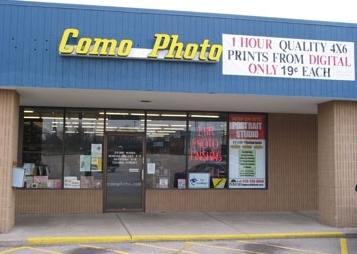 Como Photo of Watertown will close its doors on April 30th, after serving the community for almost 90 years. Como is closing because changes in the marketplace and consumer buying habits have made the business no longer viable, owners Paul and Dawn Strohbusch said. The Paul and Dawn Strohbusch purchased the business from Watertown residents Bill and Jim Welch in July 2003 and transformed Como into a digital processing center. The business was started in 1918 by Lloyd Cook and Harris Montgomery.